Click here for class schedules, pricing and to sign up today! If you’ve always wanted to take scuba diving lessons, and check out what it’s like to swim underwater with dolphins, check out the awesome coral reefs, and see a whole new world underwater, then this is where it starts! Get your scuba certification with the PADI Open Water Diver course – the world’s most popular and widely recognized scuba certification. Join millions of other people just like you that have learned to scuba dive and gone to exotic locations with this class. To enroll in a PADI Open Water Diver Class (or Junior Open Water Diver Class), you must be at least 10 years old. You will need to have adequate swimming skills and need to be in good physical health. You don’t need to have any prior experience with scuba diving to start the PADI Open Water Diver Class! This class will allow you to earn you Open Water Scuba Certification (or C-Card, as we call it). 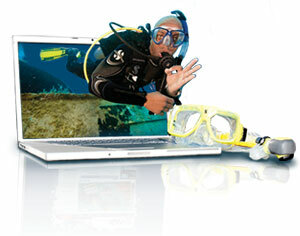 You can take your c-card anywhere in the world and be able to dive (within your training – Sorry, no cave diving yet! ), rent gear, and get tanks filled for use in scuba diving. This is conducted by online training through the PADI eLearning system. No longer do you have to sit in a classroom and listen to an instructor talk! This is a fun, interactive and dynamic system with videos, reviews, and reading all combined into one that you can go through where ever you have an internet connection! You can study at Starbucks, work (gasp! ), or the comfort of your own home! It will take approximately 8-10 hours to get through all 5 modules and the final exam. Once you finish the eLearning, simply print out your eRecord that shows your passing scores, and you are ready for the next phase, the Confined Water! You are now ready for the final phase! During the Open Water weekend, we will go out to a local lake -Clear Springs Scuba Park in Terrell Texas – where you will practice the skills that you learned in confined water. This is a spring fed rock quarry that has boats, airplanes, and platforms to train on. We have a permanent pavilion on site that we will meet up to conduct training. After 4 dives, you are a PADI Certified Open Water Diver through Adventure Scuba and Snorkeling Center! Pick out a date from the schedule below. During the warm months, we have a new class that starts every weekend!! So start NOW! Click here to sign up today! Give us a call at 972-423-3483 to schedule your confined and open water weekends. You will need to pick both an Open Water Class and Lake Weekend. You are not required to choose back-to-back weekends.